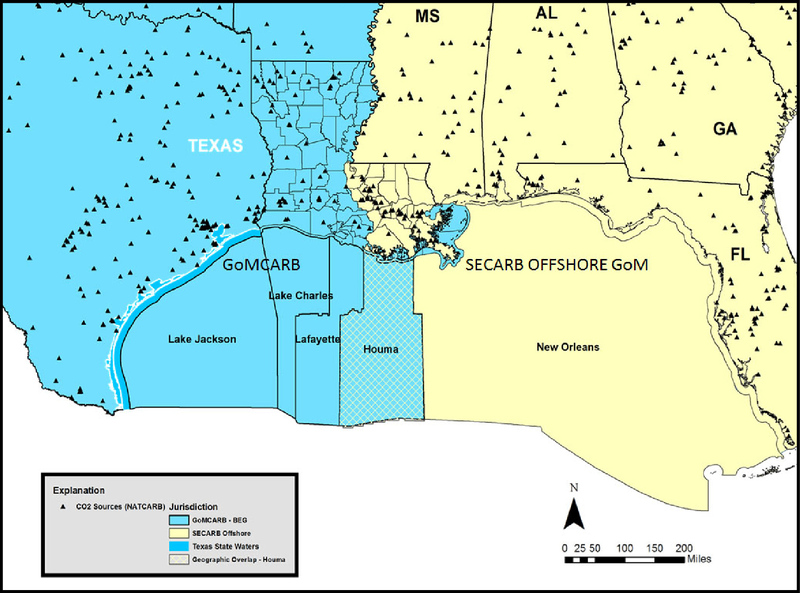 GoMCarb and a concurrent partnership led by SECARB will focus on the assessment of offshore (sub-seafloor) geologic carbon storage beneath the Gulf of Mexico. The offshore region provides unique challenges to carbon storage, but also unique opportunities. 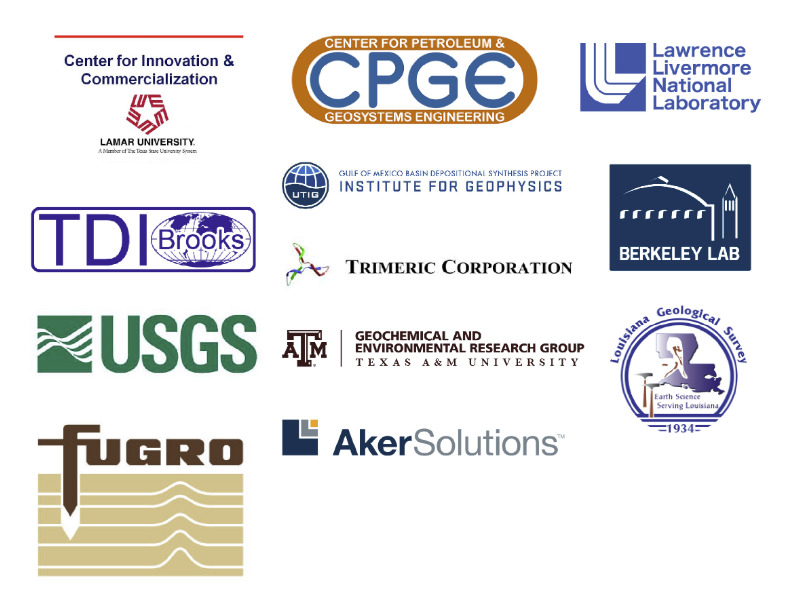 The GoMCarb partnership compiles data and expertise in the region, integrating academic research institutions, government entities, and industry affiliates to address knowledge gaps, regulatory issues, infrastructure requirements, and geologic and engineering technical challenges of storing carbon dioxide (CO2), a greenhouse gas emitted to the atmosphere during energy production. 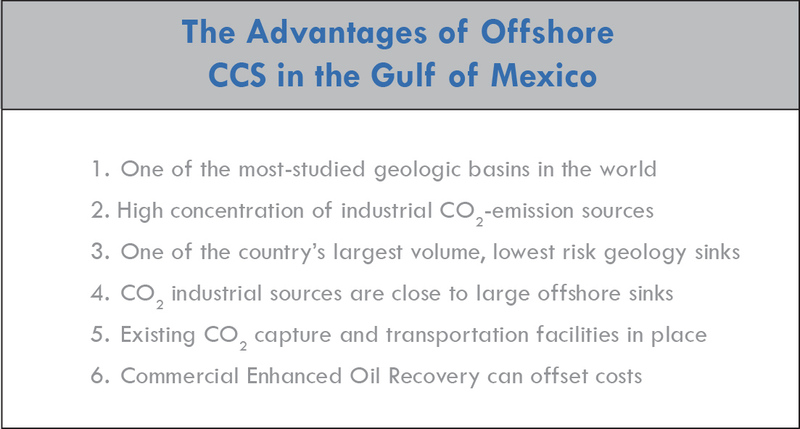 While the topic of Carbon Capture and Storage (or CCS) has been researched for almost 20 years, only recently have the opportunities and advantages of offshore storage a kilometer or more beneath the seafloor of the Gulf of Mexico been identified. Why far below the Gulf of Mexico? The states bordering the Gulf of Mexico (Texas, Louisiana, Mississippi, Alabama, and Florida) emit a large proportion of total U.S. CO2 emissions from industrial sources, but the surrounding offshore geology also provides some of the greatest potential for CO2 storage. As one of the most explored subsurface geologic basins in the world (for oil and natural gas), the GoM is data-rich and well-understood with large storage resources and high quality seals. The Gulf of Mexico (GoM) offshore basin is one of the largest volume regional geologic sinks in the United States for large-scale CCS activities. 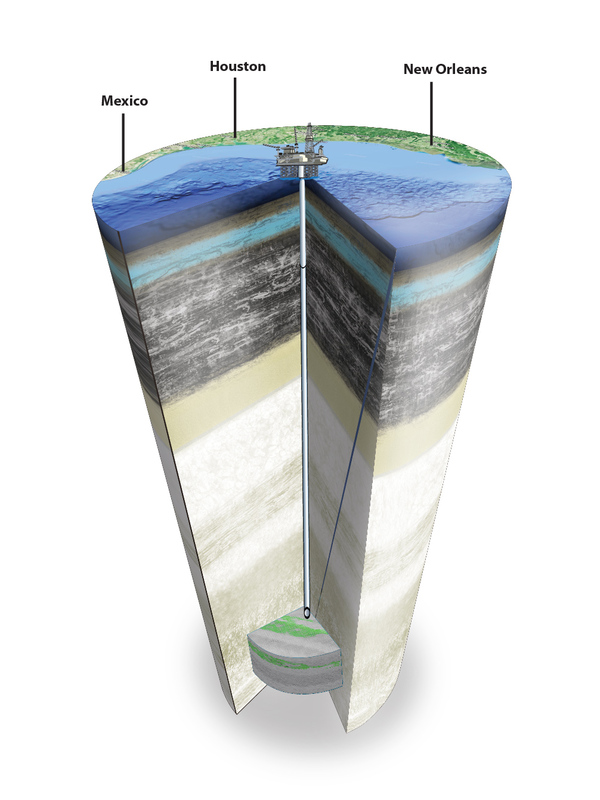 Offshore geologic reservoirs deep underground provide the most viable near-term, low-cost and low-risk storage options, lowering geologic barriers to large-scale implementation and increasing the possibility of significant CO2 emission reduction and commercial development in the region. Lessons learned in the Gulf of Mexico could be transferred to other national offshore areas in the future. Major reductions in national emissions could be achieved by further developing offshore storage options through integration of capture, transport, and permanent geologic storage. Map of the northern Gulf of Mexico (GoM) showing the initial primary geographic region of focus for assessing possible CO2 storage sites in the GoMCarb partnership (blue) and the companion SECARB Offshore GoM partnership (yellow). The cross-hatched region (Houma district) comprises an area of shared interest. Onshore CO2 sources (triangles) will be matched to offshore CO2 storage sites. Regional geologic datasets identified allow for extensive characterization and study to identify the strongest candidate sites for offshore CO2 storage. The goal of this task is to identify potential subsurface geologic storage reservoirs and assess whether they are candidates for enhanced oil recovery (EOR), which provides revenue to offset the cost of CO2 storage projects. Through its partnership with the Gulf Basin Depositional Synthesis project, GoMCarb will have access to unparalleled data and expertise on the subsurface stratigraphy of the GoM Basin. By using the available data and identifying the remaining gaps, GoMCarb will provide a geological and geophysical framework to assess offshore regions of the GoM for CO2 storage. The highly-characterized state waters on the near shelf provide a data-rich starting point for additional subsurface study. As federal data becomes available for the outer continental shelf, the assessment coverage of offshore CO2 storage will extend further into deeper parts of the gulf. Once the data are compiled, GoMCarb will assess any remaining data gaps in order to develop strategies to acquire needed data. Known data gaps in implementing offshore CO2 storage include: feasibility and cost of reusing existing oil and gas infrastructure; limited subsurface data generally in the eastern GoM, some in the north-central GoM; needed conversion and georeferencing of older data; and economic models to help determine primary barriers to deployment. Once data gaps and strategies to obtain missing data are identified, sites that are candidates for potential offshore storage will be assessed for enhanced oil recovery (EOR) potential. 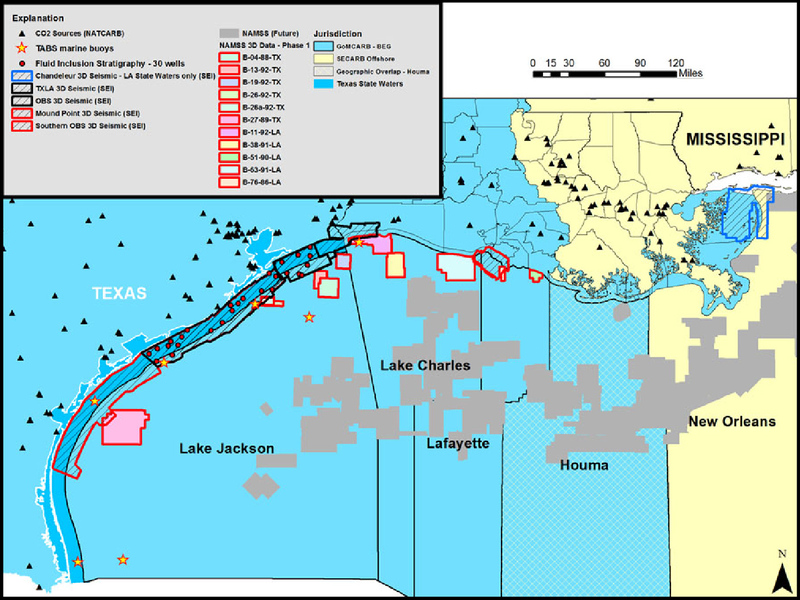 Using an approach developed by the United State Geological Survey (USGS), the storage potential of offshore hydrocarbon reservoirs will be assessed, ranked, and evaluated for CO2-assisted EOR. As this is the first attempt to characterize offshore EOR, potential issues related to the geotechnics of the offshore environment will be considered. Areas with stratigraphic potential for EOR will be identified and mapped. Offsetting the high capital costs of offshore storage will be addressed by exploring different EOR revenue scenarios so that industry facilities are aware of the various opportunities to adopt CO2 capture devices and storage leases. In an effort to anticipate risks and develop mitigation strategies for offshore environments, GoMCarb will adapt current onshore storage risk assessment and mitigation strategies, such as DOE’s NRAP tools, to offshore environments. In addition to nationally employed protocols, GoMCarb will collaborate with international projects currently storing offshore to learn beneficial and economical practices that may be appropriate for the unique geologic setting of the Gulf of Mexico. Offshore well management is a priority in understanding feasibility and adaptability of these methods. 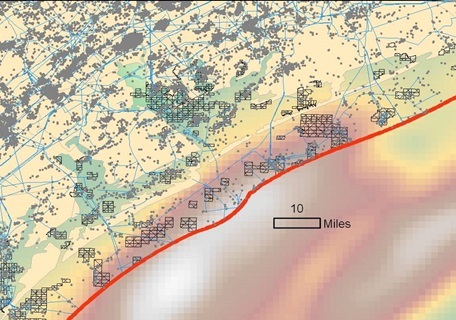 By extrapolating the findings found within localized study areas, GoMCarb will be able to assess the impact of structure, pressure, and rock property variability on storage capacity across the GoM. 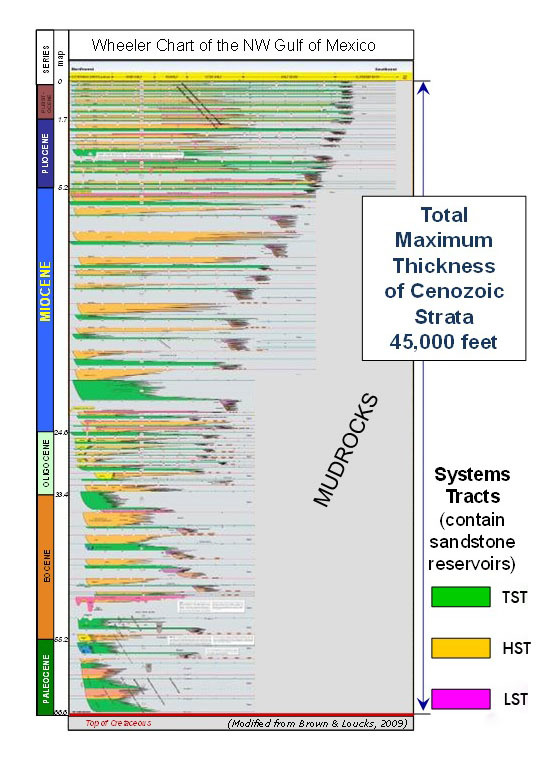 Using geologic characterizations of the GoM found in the Offshore Storage Resource Assessment task, GoMCarb will perform numerical simulations to assess the impact of reservoir geology variation on CO2 injection and storage. This modeling will help anticipate conditions that could lead to a potential leak and the effects of a leak in the water column above a well to build a basis for future leak identification and mitigation plans. Using models, GoMCarb will describe the effects of varying physical and chemical processes on CO2 migration within a storage reservoir, and potentially through the caprock, overburden, and water column above. 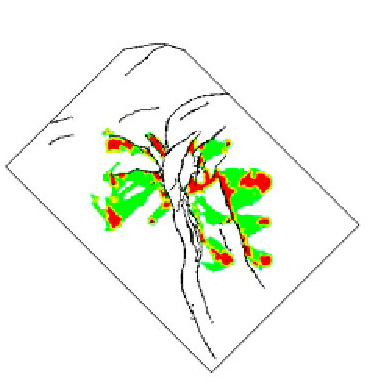 Using one or more selected field sites, a more precise model will be built to better define the limits on capacity as a result of overpressure, lateral migration, or overfilling. Using 3D seismic volume data from the TXLA project, GoMCarb will study how multiple reservoir storage projects interact within one basin system, focusing on pressure influences on stratigraphy and overall structure. To quantify CO2 trapping as it microscopically moves within dipping compartments typical of the gulf, GoMCarb will engineer laboratory sand packs that reflect the heterogeneity of the gulf’s geologic settings to quantify the structural-, capillary-, and dissolution-trapping of CO2 during fluid flow at the sediment pore-scale. Lab simulations will build confidence in numerically-simulated predictions. To anticipate the costs associated with subsurface carbon storage, GoMCarb will conduct literature reviews and economic modeling to identify revenue streams and profit points for more-expensive but more-plentiful offshore storage. 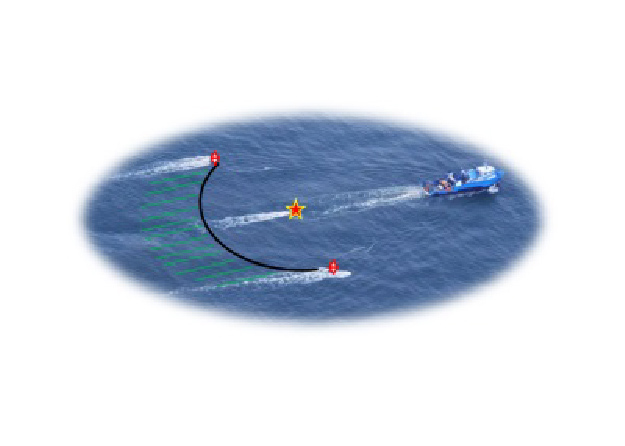 GoMCarb will identify and mature a suite of established monitoring, verification, and assessment (MVA) technologies that are suitable for the unique offshore environments encountered in the gulf. GoMCarb will then test and validate these technologies under GoM conditions and see how they perform when monitoring the subsurface, seabed, seawater, and CO2 transportation pipelines. Technologies such as ultra-high-resolution 3D (UHR3D) seismic data (P-cable) and distributed acoustic sensors (DAS) will be assessed for monitoring deep injection reservoirs and the geology overlying the reservoir. GoMCarb will compile and analyze risk assessment and mitigation practices used by international offshore storage efforts, past and present, to assess beneficiary and economical practices. GoMCarb will identify CO2 offshore transport and delivery options, logistics, risks and regulations in the gulf region, including assessing the feasibility of decommissioning and re-purposing existing infrastructure to facilitate offshore CO2 storage. Existing infrastructure such as pipelines, platforms, and wells will be assessed, collated, and mapped to the location of potential offshore storage reservoirs. GoMCarb will link source-transport-storage options in the Gulf of Mexico, from transportation from the source of CO2 to the offshore storage wellhead, and identify processes to optimize field operations, reservoir response, and operation costs. GoMCarb will provide outreach and education with two main emphases: the public and technical stakeholders. For public stakeholders in the focus area, GoMCarb will raise awareness of potential subsea geologic CO2 storage in the region and provide information, with the aim to reduce environmental concerns and increase responsible business development. For technical aspects, GoMCarb will deepen engagement with technical audiences, regulatory personnel, and source industries to share knowledge and resources. GoMCarb will maintain regular lines of communication and coordination with BOEM, EPA, Army Corps of Engineers, and other state and federal regulatory agencies to facilitate a dialogue on technologies available, protocol development, and key project updates to ensure the long-term storage of the greenhouse gas, CO2, in de-commissioned or otherwise available offshore environments. This study is funded and managed by the U.S. DOE/NETL, under award number DE-FE0031558. Check back often to follow the evolution of insights from the Gulf of Mexico partnership for offshore carbon storage. GoMCarb project updates will be released quarterly at a minimum. The first annual GoMCarb project meeting in partnership with SECARB Offshore was held at Lamar University in Beaumont, TX. View all presentation slides from the first day updates here. View the meeting report here. GCCC, the project leaders, have been working in carbon capture and storage (CCS) for 19 years and conducted the first assessment of large-volume offshore storage resources in the GoM in 2008. Using insight gained over the last 19 years of GCCC’s CCS research, GoMCarb will apply the capacity and retention research to the entire Gulf of Mexico and applying it to sub-seafloor storage. The partnership includes an Advisory Committee with international experts in offshore storage, business leaders that have expressed interest, and key participants such as state and federal stakeholders, regulators, advisors and land owners. The Advisory Committee will help guide Partnership activities to assure that current best practices are used, that technical approaches are well-adapted to the region, and that appropriate communication strategies add value to project outcomes. RO and advisory meetings will be posted here.